The Christmas season carries an energy and cheerfulness like no other and creates a need for the coziest of atmospheres. For this intimate dinner party, we used classic elements of Christmas as inspiration to create an innovative and modern setting. We designed the room with a crisp palette and an overall gloss by merging traditional Christmas red and green colors with contemporary, icy cool winter wonderland colors. Our focal point was no doubt the lounge area showcasing our velvet green sofas. Placing these furnishing in front of a wall of alternating portable wood palette walls and 3D boxwood hedges highlighted by warm spotlights created a comfortable backdrop to mingle all the way. We could not have picked a more perfect time to fall in love with these velvet green sofas! 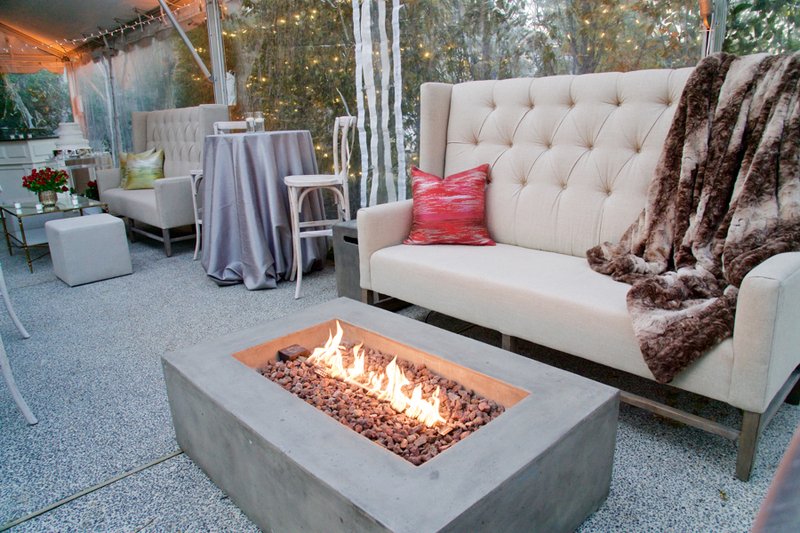 These green beauties have a cozy look to them, thanks to the velvety-soft material, so to increase the comfort of the area we strategically centered the stone fire pit between the sofas that insured the warm, fuzzy feeling was felt all night. Red Sunbelt accent pillows and plush faux fur throw blankets served as contrasting-colored accessories to complete the look. As a soft compliment the velvet green sofas, our linen Sasha settees provided extra lounge seating for guests to mingle and enjoy the evening’s festivities. Between settees we placed cocktail tables with the debut our silver shantung linen. Sticking to tradition of the season and its winter chill, we sprinkled in metallic, reflective, and transparent accents such as the Midas coffee table and clear acrylic shadowboxes to provide a cool color balance and added another layer of texture and holiday elegance to the room. Keeping with the concept of comfort, we set up a projector for guests to watch the college basketball game during dinner, as if they were back at home. We definitely scored with this added touch. When people weren’t watching the game, they stopped by the Hepburn bar decorated with a classic Christmas wreath to fill them with the tastiest of holiday spirits. 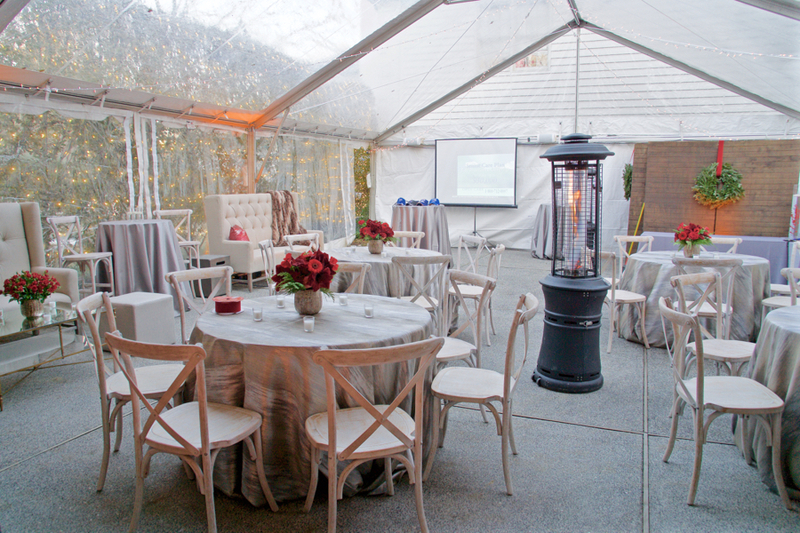 To bring in the icy element of a winter wonderland to the setting we draped dining tables with silver Sunbelt linen with whitewashed x-back chairs placed around them. 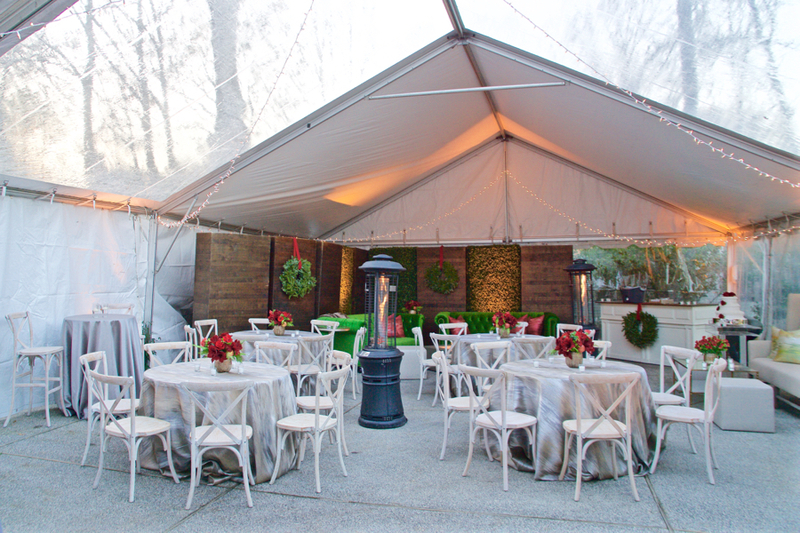 Next Christmas, let us help you plan the perfect holiday office party for you and your team. And yes, we can bring the gorgeous green velvet sofas, too!